I hope you all enjoyed your Christmas Day yesterday, ate too much & caught up on some ZZZ's! I had the day off from crafting, spent time with my family & got spoilt rotten!! So after a day of lovely relaxing, eating prawns & a glass or two of wine, I'm back to it & here is my crafty craftiness for the day!! Enjoy!! 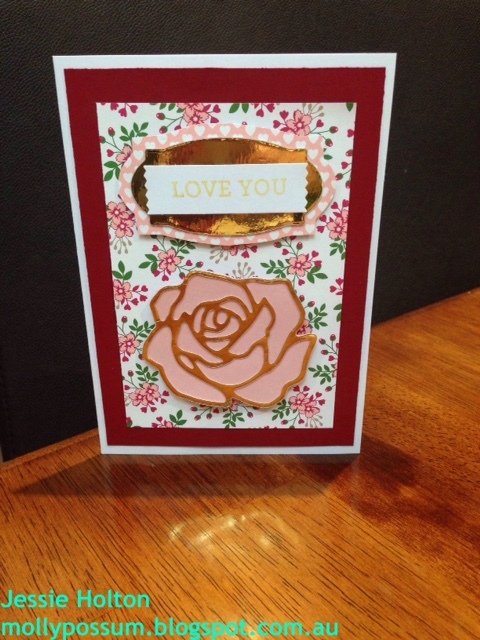 This beauty is made on a Whisper White card stock base, layered with Cherry Cobbler card stock and Love Blossoms Designer Series Paper. The Gold Foil Rose & Label have been cut from the Rose Garden Thinlits die set on the Big Shot. I have fussy cut the pink hearts Love Blossoms DSP under the gold label. 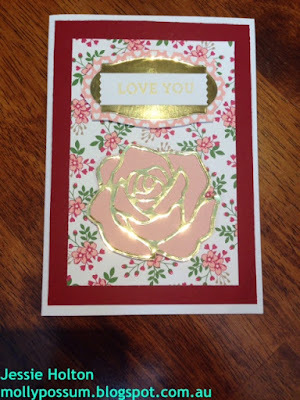 The sentiment is from the Bloomin Love stamp set, in Gold ink on Whisper White card stock & cut out with the Washi Label Punch. 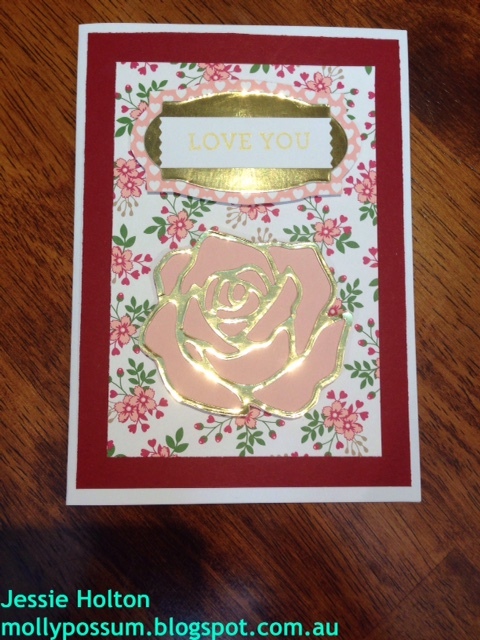 I have fine-tip glued the gold rose onto Blushing Bride card stock & then fussy cut it out. Both the rose & the sentiment are set up on Dimensionals. Other products I've used are below. Remember to use my December Hostess Code 3JKG26HJ when ordering so you get extra goodies from me! There's only a few more days to share in the sharing fun! Please sign up for my newsletter so you don't miss out on any of my specials!